What are crystals? They are an organic and inorganic substance often seen as objects of beauty, but they are also potent sources of healing power. The Elixir of life! Gem elixirs work by energy transference as used in natural medicine. Crystal energy works hand in hand with modern medicine as part of pacemakers and in surgical lasers where rubies are all powerful. Crystal healing works on every level. Crystals transmit energy and so doing dissolve stress, clear blockages and can rebalance your environment. A negative energy is drawn away with a crystal and areas requiring energy are stimulated and areas over exhausted are reduced back into harmony. 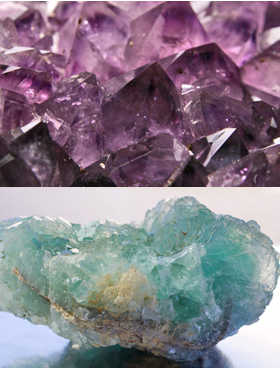 It has been scientifically proven that crystals collect, retain and amplify energy. Using various crystals and techniques healing is non-intrusive as it is given through the clothing and is very gentle. Crystals can be used to enhance meditation; aid in manifestation drawing what is needed closer. They also offer protection by absorbing negative energies and strengthening others. Specific crystals heal specific diseases not only in humans but animals and the environment. Unwanted energies are repelled by the use of crystals.